Last week the legislature adjourned sine die yet again without holding a hearing on an Add the Words bill. 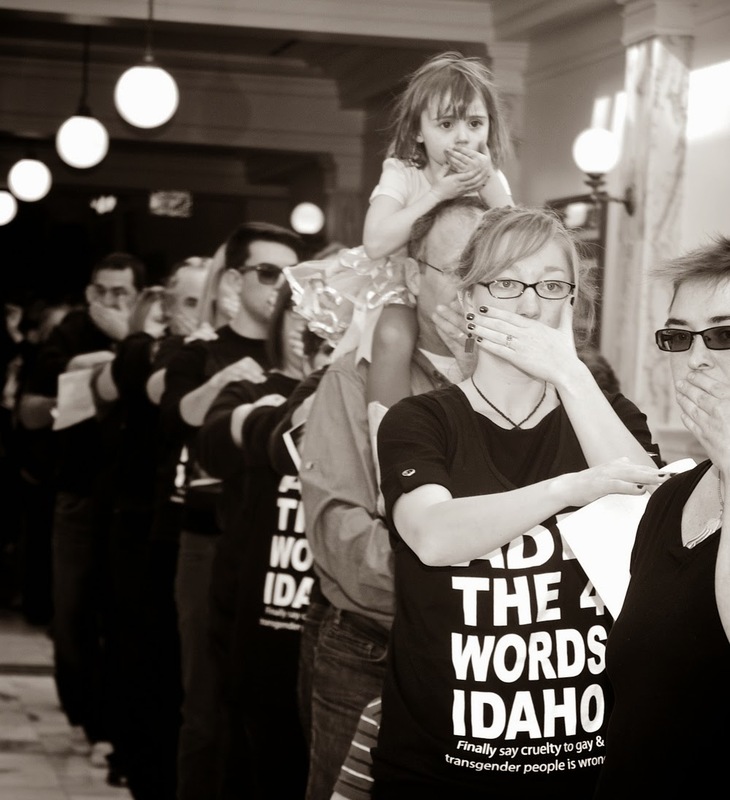 The lives of LGBT Idahoans, those who live in fear each day, are still being ignored. For the eighth consecutive session, by not saying in law that discrimination is wrong, leadership has sent the message that they are on the side of those who would discriminate. And this session, it became even more sinister, as the majority party tried to bring forth a so-called "religious freedom" bill--the same bill that has been pushed in states all over the country. Rather than protecting the most vulnerable of our communities, it would have protected those cruel enough to discriminate. Thanks to YOU, and the overwhelming numbers that came out in opposition to this bill, we made them think again about moving it forward and it died officially with the end of the session. It has unfortunately been said publicly by Rep. Luker that he wants to bring the bill back next session. While the session may have ended, OUR WORK HAS JUST BEGUN. Please keep watching our page for opportunities to help, opportunities to engage with legislators. Please keep writing those letters to your legislators, expressing your disappointment in their handling of the Add the Words legislation efforts. And remember, we're headed into election season and chances are there is an election near you that could use volunteers to try to replace legislators who are not listening to their constituents. We told them we would never give up, and we meant it. We are not going away, and with your help, session #9 will begin with this issue in the forefront of their minds. We’ve packed the gallery. We’ve packed the Capitol. Now it’s time to WRAP THE CAPITOL! You have shown up in amazing ways this session—you have stood up for your LGBTQ brothers, sisters, friends, neighbors, children, and family. You have written letters, made phone calls, testified, and contacted your legislators. Sometimes the notice was very short, and still you brought huge numbers to drive home the point that discrimination is wrong, and that Idaho will not stand by and let her citizens be treated unfairly. With only a few days left in the Idaho legislative session, we need you to show up again and remind this legislature that they have not done the business of the people. They have not accomplished the things they were elected to do. We need to drive home the point that they still have time. This is the year. Now is the time to ADD THE WORDS. 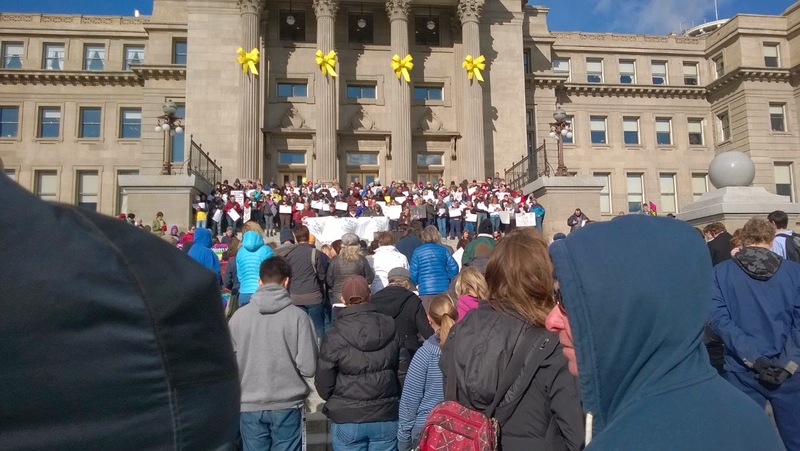 And that if they fail to Add the Words once again we will still be here and we will not give up until Idaho is a safe place for all of her citizens. ***WRAP THE CAPITOL*** MONDAY, MARCH 17th 2014, 5:00-7:00pm*** You know you're going to go downtown anyway, so before you head for that green beer, come support your LGBTQ community members, and take a stand for what is right on this St. Patrick's Day! WHERE: CAPITOL BUILDING—meet on the front steps. Bring your signs and be ready to march! 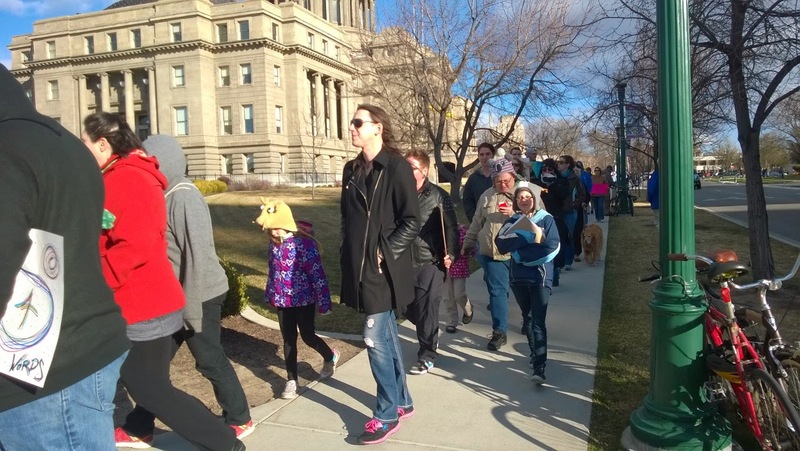 We are going to WRAP ourselves completely around the capitol, marching around and around as the legislators leave for the day, so they have to see those they keep trying to ignore. So they have to see how many of us are in support of adding the words!! Bring your testimonies (Just as if you are testifying at a hearing)! If you feel compelled, we will have a microphone set up on the Capitol steps so that, as the legislators leave the building, they will hear us telling the stories that they refuse to hear. We will also record your stories for future use! Remember: This is a peaceful protest, following all rules of peaceful assembly. DO: Show up on time. We want to be in place; marching peacefully around the Capitol before lawmakers leave for the day. How amazing will it be for lawmakers to have to walk through us on their way to their cars? Do show up and do bring your friends and families! DO NOT: Block ANYTHING or ANYONE. This is a peaceful protest, and we will be following all statehouse rules. It’s the peoples’ house, and we are allowed to be there with our signs and our stories, but as the lawmakers leave, be respectful and make sure they can get through our line. DO NOT engage in any personal character attacks on legislators. Keep signs respectful and FOCUSED ON THE ISSUE. REMEMBER: With this many people, things can escalate quickly. We need to stay calm, quiet and respectful. And most of all, we have to SHOW UP. Thanks for sharing this beautiful blog Stacy Ericson! After a hard week holding the line against Human Rights progress, Idaho legislators must have been ready to put their feet up and enjoy Oscar night. For months now, they have gone about their business in the white halls of the statehouse, while trying to avoid making eye contact with constituents standing in mute protest outside their chamber doors. The courage of the thousands of participants in the Add the Words campaign has garnered local sympathy and national attention. The the eloquent faces of these human rights activists, the long silent lines of caring people of all ages, their mouths covered, their eyes dark with distress--this would move most people. Oddly entrenched, Idaho Legislators are not moved.